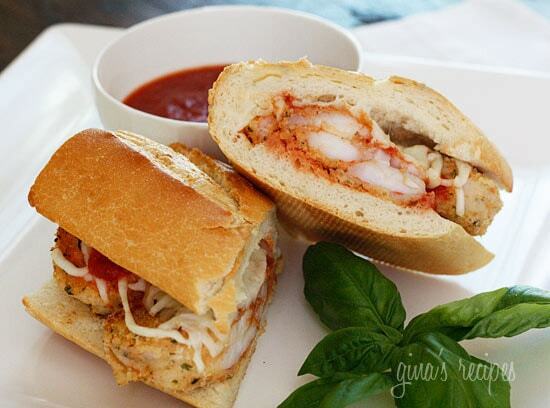 Breaded shrimp topped with pomodoro sauce and melted mozzarella cheese on French bread. One bite of this sandwich and your significant other may ask you to marry them! 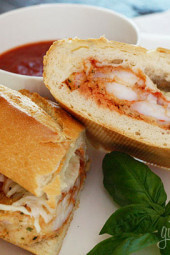 As the weather starts to cool, hot sandwiches make a fabulous meal, and shrimp parm heroes are one of my favorite sandwiches, however ordering this from my favorite Italian restaurant would be well over 25 points with all it’s deep fried shrimp and masses of cheese and sauce. This lightened version uses my Healthy Breaded Shrimp recipe, part-skim mozzarella cheese and I serve it with extra sauce on the side to dip. For the bread, I used my skinny tip to scoop out some of the bread to make larger sandwiches for less calories. This would make a great addition to to your game-day menu for all you football fans out there! Follow cooking directions for the baked shrimp recipe. 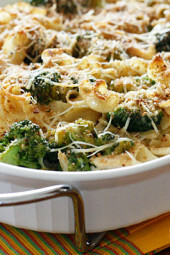 Preheat oven to 425° or set your broiler to low. 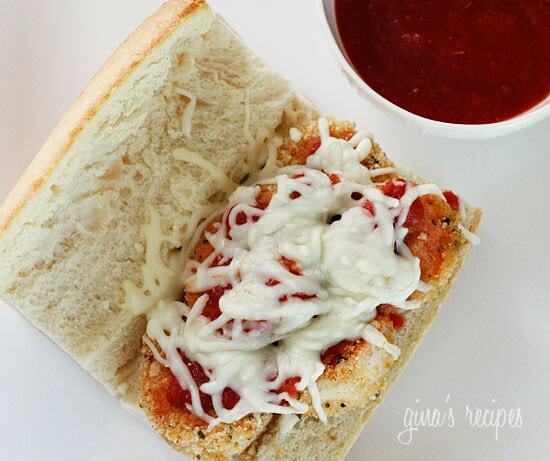 Top each sandwich with 2 tbsp of sauce and shredded mozzarella cheese. 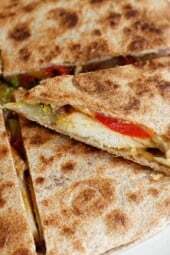 Place sandwiches on a cookie sheet and heat in the oven or broiler until the cheese melts; 2 – 3 minutes, careful not to burn if using the broiler. Would the carb count be the same with the bread scooped out? Pingback: National Sandwich Day- 6 great recipes and more! Just made this for dinner – everyone loved it even though not all generally enjoy shrimp – thanks for a great recipe! What would the point plus value be if you didn't put it on bread? I made this for dinner tonight, and while not all my kids appreciated it, they didn't reject it completely either. And they happily ate the bread guts from my sandwich! I personally loved this! Any suggestions for a good side dish to this? Looks delicious! If you eat it with the bread, then a salad is perfect. I'd have never thought to make SHRIMP parm. Brilliant! I have left overs from the other day of the Healthy Breaded Shrimp. This is perfect to finish them up! 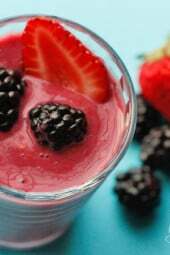 What great recipe; just love a simple yet fatastic treat; keeping this one for the weekend. Thanks Tara and Kelly! 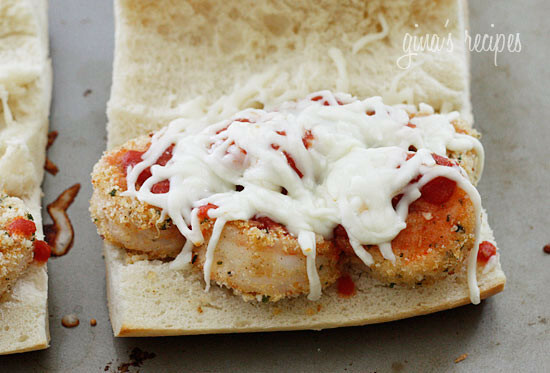 It's just as easy as making chicken parmigiana, especially with larger shrimp. It's so good over pasta too! I agree with Tara, Genius! I've ever thought to make shrimp parmigiana, but since I like it MUCH more than chicken this sounds fantastic. Genius Gina! That's what I'm going to call you from now on. This is going on my menu for next week. Those shrimp look delicious! Love the tip of scooping out the inside of the bread! This looks great – all those crispy shrimps and a healthy option too! A keeper! 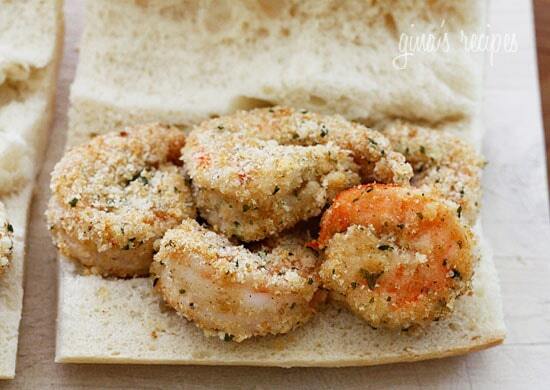 What would the points difference be if you subbed chicken (baked) for the shrimp? YUM! I love shrimp, this looks tasty! So delicious dear Gina! I'm a vegetarian but Shrimps I miss most! So tasty!